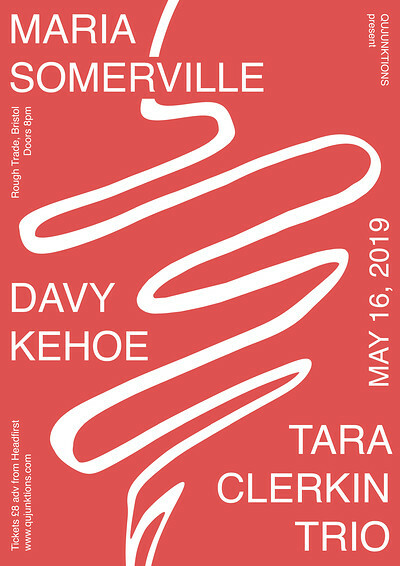 MARIA SOMERVILLE's heady drone-pop vapours mingle with the nimble neo-motorik manoeuvres of DAVY KEHOE and his band, with support from Bristol's TARA CLERKIN TRIO making a spry kind of sense. Maria Somerville draws on folk forms alongside post-punk, traditional Irish motifs, starry eyed pop and hypnotic drones to create wholly original music that is borne of her roots in Connemara, Western Ireland. Davy Kehoe is a producer from Dublin associated with the Wah Wah Wino label. He is best known for the enigmatic but the unique stew of motorik rhythms and fourth world aesthetics that fills his debut album Short Passing Game, released in 2017. Tara Clerkin Trio are a three-piece from Bristol; synth, live drums, clarinet and vocals. Some minimalism inspired, some groovy jazz influenced, some loop-based electronica, some noisy bits.